U.S. copper prices in cents per pound from 1959 through 1974. In 1973, the price of copper rose to a point where the metallic value of the cent was almost equal to its face value. To find affordable alternatives, the United States Mint explored a variety of metals, including aluminum and plated steel. This extensive research project concluded that a 96% aluminum alloy was the best alternative for the copper cent. The production of experimental pieces is a formal process that is specifically governed by Mint Regulations. 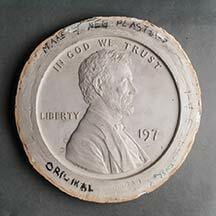 All authorized experimental striking of a one-cent piece during the study required the written approval of the Director of the Mint. Some experimental pieces were made with standard one cent dies, using the existing design. In 1974, a batch of experimental sheets of an aluminum alloy was sent to Denver to be cut into cent blanks and shipped back to Philadelphia. This was done because Denver’s blanks were slightly larger than the ones used in Philadelphia and the experimental team wanted to see if the different size affected the alloy’s utility. The Denver Mint was not authorized to strike any experimental aluminum cent and most of the blanks were returned to Philadelphia as instructed. Nonetheless, at least one Denver Mint employee recalls striking experimental cents on the aluminum blanks using used an existing “D” marked die. This effort was unauthorized and in direct contradiction to official instructions. In March 1974, the House of Representatives introduced a bill to authorize the United States Mint to issue one-cent coins composed of the proposed aluminum alloy. Ultimately, Congress declined to enact the legislation and prices quickly fell by year’s end when the government released its supply of stockpiled copper. When the price of copper rose again in 1982, the Mint changed the composition of cents to a copper-plated zinc alloy. In 2016, an heir of Harry Edmond Lawrence, the now-deceased former assistant superintendent at the Denver Mint, returned the 1974-dated “D” aluminum cent that had once been in the possession of his father. The United States Mint is dedicated to the integrity of United States coinage and the numismatic hobby. The return of the unauthorized Denver specimen supports the longstanding and fundamental principle that items made at United States Mint facilities, but not lawfully issued or otherwise lawfully disposed of, remain property of the American people.